By Luke Kirwan, open access manager, IIASA library. Who reads your paper after it’s published? Altmetrics (Alternative Metrics) are a recent innovation designed to supplement traditional metrics, such as impact factors, which provide an overview of a journal’s standing within academia. However, these traditional measures are unable to take into account the dramatic changes in publishing and dissemination that the internet has brought. Altmetrics complement traditional methods by accounting for the broader reach and impact of research online. They achieve this by tracking the digital identifier of research output, through DOIs, PubMed ids, arXiv ids, across a broad range of social media, mainstream media, blogs, policy documents, and reference management tools. This provides an immediate, broader, and more detailed overview of the impact of your publication. Each mention is given a weighted score, so for example a mention in a scientific publication is weighted far higher than a tweet. There are several well-documented studies of the benefits of article level metrics over impact factors. When we designed the new IIASA Publication Repository (PURE), we incorporated altmetrics, because in today’s world, traditional metrics like impact factors no longer tell the whole story. The concept behind altmetrics is to broaden how impact is measured, beyond simply counting citations. I think of altmetrics and impact factors as two complementary tools with the same goal, but different ways of getting there. You can see the citation and usage data for an article in the Altmetric “donut” at the bottom of a record. 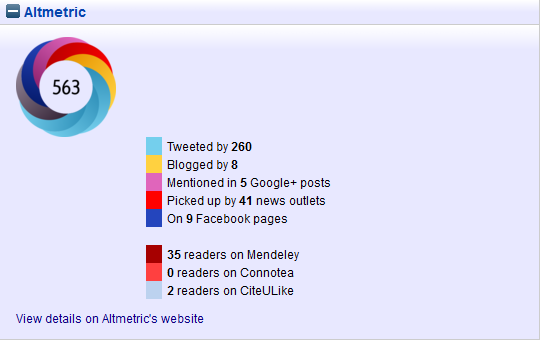 By clicking on the link to Altmetric.com you can then access more detailed information about that publication’s reach. One of the core concepts behind altmetrics is that people should be able to access every mention that has gone into the weighted score. So by viewing the details for a record on Altmetric.com you can also find out who was tweeting about your paper, what newspaper articles it was mentioned in, who was blogging about it, and any other coverage. This means that you can immediately see the type of attention being generated by a piece of research, where this attention is coming from, what influence it has, and the geographic spread. Altmetrics relies on real-time data so results can be quantified rapidly. The goal is to quickly provide an overview of the diversity of areas where your research is being talked about. It is important to note that altmetrics is only assessing mentions of a research paper—it makes no judgement on quality. So this feedback needs to be read in the context of the quality of the paper and the research. This is partially the reason why Altmetric are so open about what information they use to generate their results. So what is a good altmetric score? This is not a particularly straight forward question as an altmetric score measures attention, which can be positive or negative. To help you understand your altmetric score select the “Score in Context” option. This will breakdown how the score compares with similar articles, all tracked research, and the output from that journal. There are a number of ways you can help boost the attention your research is receiving. The first is to ensure that your research is made available in a repository as soon as possible. The sooner your research is accessible, the sooner it can be used and referenced. The better the metadata for a record the more visible is will be online. Older entries are also accounted for, though of course publications over ten years old do not benefit as much from social media. We are currently working through older entries in PURE to update their metadata. Tweeting and sharing your research will also help, especially if you use the social media analytics to identify who has been using your work in the past and develop connections with them. A second way to improve your score is to develop your presence on informal social networks, like Twitter, blogs, and more structured academic networks like Google Scholar and Academia.edu. By linking them together you will boost your online presence and help ensure that your research reaches as many people as possible. Altmetrics relies on digital connections between your output, yourself, and your peer network so strengthening these linkages will help improve your visibility.